I'm a huge fan of heavily scented shower gels and foams - which is essentially why I love the Bilou Creamy Shower foam in Pink Melon*. This smells exactly like those pick n mix watermelon sweets yet somehow doesn't smell like a 10-year-old girl. I've tried a lot of shower gels, but this is definitely the strongest scented! I love the foaming quality, as not only is it perfect for shaving, but it reminds me of when I was younger and my mum used to tell me "you're not clean until you've got a bubble suit on". And the smell genuinely does linger. I tend to use it before I wash my hair and just let it sit on my body until the last possible moment, and then rinse. It smells wonderful. You can pick up Bilou in your local Superdrug, but if you really want to try it, I'd suggest getting it online. Fave scents include Tasty Donut and of course, Pink Melon. 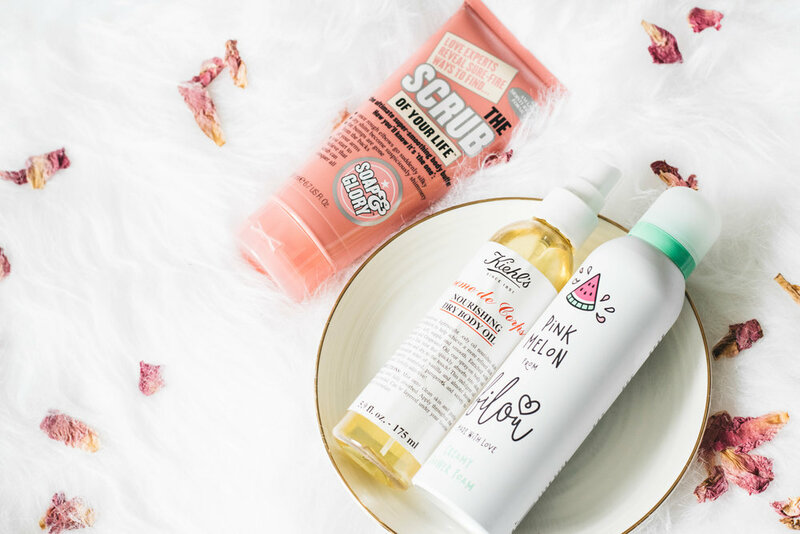 I believe it's a cardinal sin if one writes a post on shower scents and doesn't include Soap&Glory.... Well, I need to talk about Scrub of Your Life. I've never been a huge scrub person. Most of the scrubs I come across tend to come in a huge pot and are just annoying to use - and end up clogging the drain... It's a whole thing. But Scrub of Your Life is an absolute favourite. I've discovered a huge love of moisturising (more to come on that...) and I find that prepping my skin with a good scrub not only means I smell like Soap and Glory, but it really softens my skin. And with Summer supposedly right around the corner, I'm doing everything in my power to keep grey and chalky legs at bay. And finally, my moisture favourite. First, I need to give a shoutout to my OG Soap and Glory Righteous Butter which I finished off the day before I took this photos and unfortunately threw out. But if you're after a really intense body butter, Soap and Glory is the place to go. But on a day to day, after a morning shower, I've been really enjoying the Kiehls Nourishing Dry Body Oil. Now, this is definitely not as dry as the Nuxe offering, but it's perfect for the summer months as it leaves your skin with a glowy sheen. It smells divine and like you've just been on holiday - all the coconut scents, so it is definitely something I'm going to be loving in the summer. The scent lingers all day, and I've genuinely had people ask what perfume I'm wearing when I've used it! If you've got dry skin and are really looking to pack a punch, this is definitely the way to go. Slightly pricey, but lasts. What are some of your favourite shower scent favourites? Anything I need to try?